There’s no doubt that many prophetic things are happening in the Middle East right now but is it biblically accurate to suggest we are facing an Ezekiel 38-39 scenario in Syria? This verse says Gog will go up against Israel which is described as a “land of unwalled villages” and a people who “live securely”. This can hardly be said of Israel today. This takes place during the “peace” of the 7-year tribulation [Daniel 9:27]. You’d be hard-pressed to find this “other” individual in the pages of the prophetic books. What you will find in the pages of the prophetic books are references to the Antichrist. Furthermore, if Ezekiel 38-39 is a pre-Armageddon invasion of Israel led by Russia, how can Israel, afterward, “live securely on their own land with no one to make them afraid.” Is there no Battle of Armageddon coming? Is there no Antichrist coming? Do you see the disconnect? Ezekiel 39:25-29 NASB Therefore thus says the Lord GOD, “Now I will restore the fortunes of Jacob and have mercy on the whole house of Israel; and I will be jealous for My holy name. “They will forget their disgrace and all their treachery which they perpetrated against Me, when they live securely on their own land with no one to make them afraid. “When I bring them back from the peoples and gather them from the lands of their enemies, then I shall be sanctified through them in the sight of the many nations. “Then they will know that I am the LORD their God because I made them go into exile among the nations, and then gathered them again to their own land; and I will leave none of them there any longer. “I will not hide My face from them any longer, for I will have poured out My Spirit on the house of Israel,” declares the Lord GOD. Ezekiel 38-39 is just another retelling of Armageddon from Ezekiel’s perspective and Gog is none other than the Antichrist of whom the prophets spoke. So, the answer is, no, we are not facing an Ezekiel 38-39 scenario in Syria. What this does not mean is that Russia won’t be involved in a war in the Middle East. What this does mean is that Ezekiel 38-39/the Bible does not prophesy it will. Visit the following links and be informed. 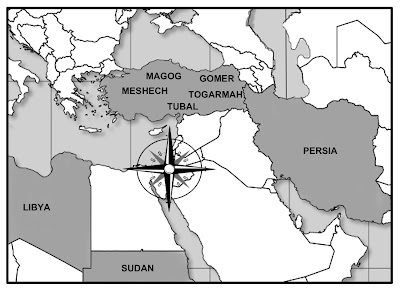 They include 6 minute video teachings plus several well-respected Bible maps which place Magog in Turkey as well as a list of the nations Christ does battle with upon His return from Scripture, which is curiously devoid of any nation outside of the Middle East. yes. just as Jesus came from Isaac’s line, the Antichrist will come from Ishmael’s line that gave rise to Mohammed and Islam [Genesis 16; Galatians 4]. Islamic prophecy is the exact polar opposite of biblical prophecy. it’s amazing, really. Islam is awaiting their Mahdi who is the biblical Antichrist. their Jesus figure, Isa, is the biblical False Prophet and their antichrist figure, the Dajjal, is our biblical Jesus Christ. i compared these prophecies and outlined it here in order that we may know who Allah really is: Do Christians and Muslims Both Worship God? Is Yeshua and Allah the Same Being?